In terms of vegetables, corn is a pretty good one. It's not particularly rare, or expensive, or even especially adventurous or nutritious. But it's fine. 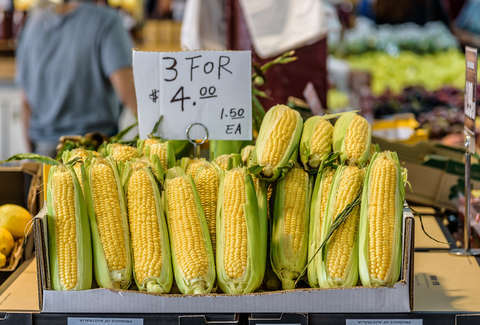 However, you'd think an ear of corn were worth as much as a brick of gold the way a crowd of shoppers recently reacted to a sale on the stuff at a Canadian grocery store, trampling and elbowing each other to get in on the deal. This past weekend, Michael's No Frills supermarket outside Toronto, Canada was running a pretty great sale on fresh corn, selling a dozen ears for $1.68, or roughly 14 cents apiece. And while there's no arguing that that is a spectacular bargain for a whole bunch of fresh vegetables, some shoppers were less than gracious or polite about making sure they cashed in on it. In fact, a few of them got so excited that they literally knocked over boxes and climbed over one another in order to get to the bin full of husks. One shopper witnessed the brouhaha from a safe distance, and managed to film a bit of it. In the clip, you can see the melee already in progress, with a gaggle of people surrounding the bin and dismembered husks strewn about the floor. If you look closely, you can even see one guy essentially body-check an old man, who eventually falls over. Apparently, this sort of thing isn't totally out of the ordinary at this particular store, according a story in blogTO, which points to a handful of posts on Reddit describing that it's a fairly frequent occurance to see shoppers freak out over sales there. Weird, who knew that Canadian corn and super-cheap French Nutella had anything in common?